On this week's Matt on the Box we have two very different types of policing drama plus department store dilemmas and doggy disasters. Earlier in the year, I was excited by the prospect of a satirical drama written by Sam Bain and Jesse Armstrong and directed by Danny Boyle. But, after seeing the finished product, I can't say I wasn't disappointed by the original pilot for Babylon. The 90-minute-long feature was tonally confused, featured an abundance of needless characters and was incredibly loosely plotted. However, the negative reviews that the pilot received appeared to have spurred on Bain and Armstrong to construct a more focused series. That's definitely the impression I got after watching episode one which centred round a riot at a young offenders' institution that was run by a private security firm. The well-observed moments came early on after a representative from Securamax debated whether what was happening was a riot or was instead simply a severe disturbance. That this conversation was utterly believable was a credit to Bain and Armstrong who deftly handled the entire set piece. I personally laughed out loud when Sharon (Nicola Walker) was appalled when the prisoners demanded stuffed crust pizza. The battle between the Metropolitan Police's Head of PR Liz (Brit Marling) and her deputy Finn (Bertie Carvel) was briefly quashed as the two decided to team up and take down Securamax. But it did appear as if Finn was still attempting to undermine the perky Liz at every turn, even creating a wife at one point. Whilst the stories surrounding the prison riot were all great I feel that Bain and Armstrong still have an issue with the amount of characters in Babylon. For example I don't see the purpose of Robbie (Adam Deacon) or the rest of the TSG Group, especially since they've stopped being the focus of a fly-on-the-wall documentary. Meanwhile the attempts to get Warwick (Nick Blood), into the main storyline were heavy-handed at best and he's still a character I find it hard to care for. On the whole though, I believe Babylon is much improved due to its slicker gags and better-paced story. In Liz, the writers have found a relatable character who is hard on the outside but is inwardly lonely and just wants a friend. I'm glad that Bain and Armstrong allow time to let us get to know a bit more about Liz and the scene in which she eavesdrops on co-worker Mia's conversation about lying to her about a social event. Marling plays both sides of Liz brilliantly bringing out both her vulnerability and confidence is equal measure. 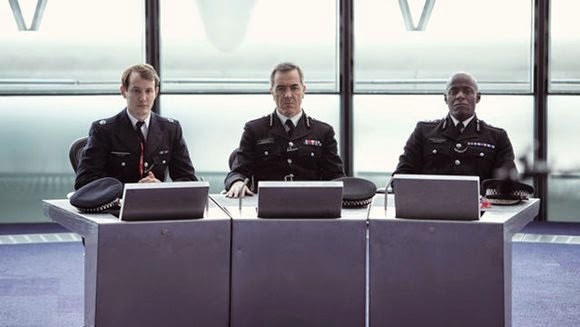 In fact, on the whole, the cast was superb with James Nesbitt coping particularly well with the pace of the dialogue as Police Commissioner Miller. I also feel that Nicola Walker's addition to the cast was a smart move as she can generally improve any programme and her straight-face delivery of some of the funnier lines was superb. In a more overtly comic role, Jonny Sweet was on form as Miller's gullible aide whilst Bertie Carvel was suitably waspish as the acid-tongued Finn. Meanwhile, director Jon S Baird made the pace of Babylon seem frantic as he kept the pace going throughout the majority of the episode. As I've already mentioned, where Babylon falls down for me is in the scenes that don't feature Liz, Miller, Finn and their ilk. Actors of the calibre of Nick Blood, Daniel Kaluuya and Cavan Clerkin deserve more than the one-note roles they've been given and I feel that Babylon would run a lot smoother if their characters didn't feature. But, overall, the positives outweighed the negatives and I have to say that this first episode of Babylon the series was one of the most pleasant TV surprises of the year. I was only planning into tune into the first episode to review it but, after enjoying this instalment immensely, I'm definitely going to come back to it next week. Also returning on Thursday night was BBC Two serial killer saga The Fall which, when it debuted last year, became one of the channel's most successful dramas of all time. 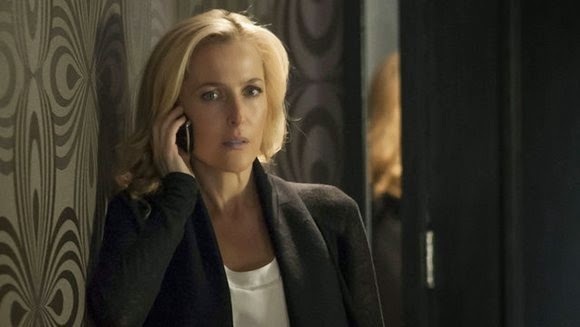 I personally was in two minds about the drama as, whilst I enjoyed Gillian Anderson's central performance as DS Stella Gibson, I felt the series was overly gruesome and was poorly paced. 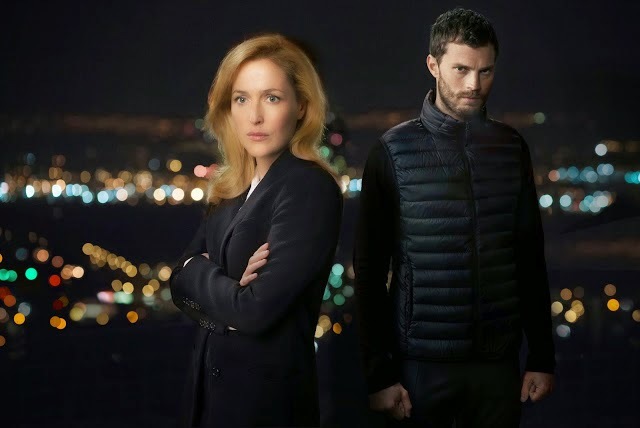 Another criticism that the drama faced was the fact that the series' final scene was underwhelming as Gibson was contacted by killer Paul Spector (Jamie Dornan) as he left Belfast. The second series continues with Stella still struggling to pin down the murderer and fighting an uphill battle with her superiors, who which to launch a review of her investigation. The fact that Stella was almost back at square one was frustrating mainly because this signalled a lack of story progression in this first episode. Fortunately, a mediocre episode was saved by a solid final third in which Stella finally got through to Annie Brawley; the only victim to survive one of Paul's attacks. We were also left with the impression that Stella had had a major breakthrough when divers found the weapon that Paul had used to attack his victims. Meanwhile, Paul was forced to return to Belfast after teenage babysitter Katie (Aisling Franciosi) revealed to his estranged wife Sally Ann (Bronagh Waugh) that they hadn't been conducting an affair. The character of Paul had been one of The Fall's most interesting aspects as his role as a charming grief counsellor made it hard for people to believe that he was a serial killer. However here, especially in a scene where Paul converses with a stranger on a train, I found that he basically acted like a maniac throughout the majority of the episode. Paul's final interaction with who we assume is his next victim was also particularly unbelievable and it demonstrated how The Fall has lost some of the subtlety of the first series. The Fall has two major strengths, the first of which is its visual set pieces in which Stella and Paul's actions are intertwined. One of these sequences that was particularly haunting saw Stella walk around the scene of Paul's most recent crime whilst he creepily stalked around the Scottish house where he'd been hiding. The Fall's other positive attribute is its performances and in particular the aforementioned central turn by the brilliant Gillian Anderson. Anderson brings an authoritative nature to Gibson and the way she commands a room is just superb. This episode also saw Anderson attempt to add a little vulnerability to the role especially in the scenes in which Stella had to cope with the press story linking her to the late James Olson. Jamie Dornan has improved as well as he makes Paul's every move strangely watchable and I found him a lot more captivating than I did in series one. Elsewhere The Fall benefits from a strong supporting cast which includes Bronagh Waugh, John Lynch and Archie Panjabi. However, regardless of how strong the performances are, they don't compensate for the fact that both of the lead characters are incredibly cold. Throughout the first series I found Alan Cubitt's lead characters extremely hard to care about and I'm afraid that feeling continues into series two. Although the majority of the investigation scenes feel realistic, Paul's outlandish activities stretch The Fall's credibility to breaking point and as a result made the drama feel overly ludicrous. Ultimately, I'm in two minds whether to stick with The Fall; a drama which has no compelling characters but has enough intrigue to keep me coming back for more. However the strong performances, especially that of Anderson, have at least convinced me to tune in next week just to see if Gibson can get any closer to getting her hands on Paul. Away from the gritty reality of The Fall, we turn to a documentary which celebrates the more luxurious elements of life. The first series of Liberty of London, which focused on the daily dealings at the titular department store, was one of my guilty pleasure favourites of last year so I was secretly glad when a second series was announced. Whilst not as strong as last year's opening episode, which featured the launch of the store's infamous Christmas store, there was still a lot to enjoy in this instalment. I personally felt that managing director Ed's idea to hold an open day for local designers to pitch their products was a stroke of genius. The fact that it yielded the force-of-nature that is Nancy, and her nail varnish products, made it all the more relevant. Nancy's reaction to seeing Nancy's Nails on the shelves at Liberty for the first time was a brilliantly emotional moment and was the best part of the documentary for me. As with last series, Liberty of London also focuses on some of the characters that inhabit the store and in particular the newer members of staff. I felt particularly sorry for new merchandiser Liz when her sports-themed windows were criticised by Ed and made with confusion by members of the general public. Meanwhile the extravagant Omar; a new addition to the womanswear department, was also give his chance to shine even though not everyone was a fan of his new work outfit. The fact that Omar and Liz were given more prominence than an appearance from Pharrell Williams, who came to the store to plug his new fragrance, tells all you need to know about the documentary. 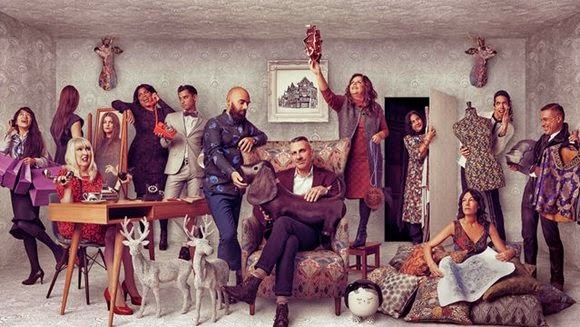 Liberty of London is ultimately an exploration of the eccentricities of us Brits and the different shapes and sizes that we all come in. Although there aren't any hard-hitting moments, this is a programme all about dragging an old institution, which was built from parts of an old warship, kicking and screaming into the 21st century. One sitcom that we at The Custard TV have been passionate about over the past few years was BBC4 nursing comedy Getting On. So the fact that two of its writers and stars; Vicki Pepperdine and Joanna Scanlan, have reunited for another BBC4 show was cause for excitement among several members of the website team. 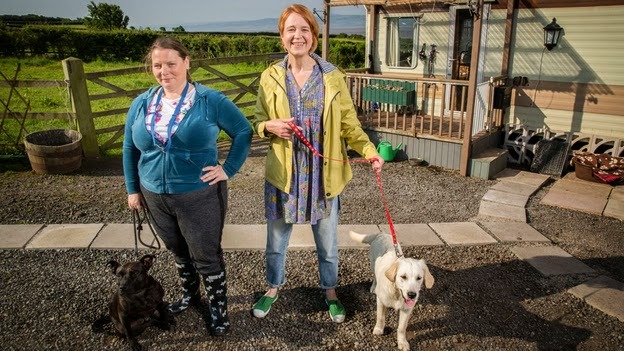 Whilst Getting On was all about gentle comedy, similar in a way to BBC4's recent hit Detectorists, Pepperdine and Scanlan's new offering Puppy Love is a lot broader. The fact that one of the first episode's recurring jokes is a dog that likes to eat his own poo tells you just how broad the humour is. But that's not to say that Puppy Love doesn't have as much charm as Getting On with Pepperdine and Scanlan still having the awkward chemistry that they shared in their previous hospital sitcom. The main focus of the sitcom is Nana V (Scanlan); a notorious dog trainer who runs her own school and also aids the police in capturing strays. As a carer for her grandson, Nana V eventually comes into contact with the straight-laced Naomi (Pepperdine); a youth worker with an unruly pooch of her own. Naomi eventually signs up for Nana V's class but almost instantly clashes with the uncouth trainer particularly due to their shared affection for widower Alexander (Tobias Menzies). I felt that, as performers, Pepperdine and Scanlan played to their strengths with the former playing a stickler for the rules and the latter portraying a more free-and-easy character. Their scenes together are definitely where Puppy Love is at its best and this is partly because a lot of the minor characters are underwritten. Whilst it probably won't top the brilliance of the aforementioned Getting On, Puppy Love is still a promising comedy that provides a sufficient amount of laughs thanks mainly to the efforts of its two leading actresses.